Working along with the Branch manager and other bank employees, the Bank Manager takes charge of the whole banking activities. The Bank Manager is not only responsible for the cash at the bank, but the Bank Manager Resume comprises of a whole lot of responsibilities that may not be limited only to the following – managing the whole branch, hiring and training new staff, monitoring sales targets, promoting and marketing branch and its products, reporting to head office, building strong customer relationship, targeting on business growth by enhancing revenue, managing budget and allocating funds, meeting goals and metrics and last but not the least developing financial plans. 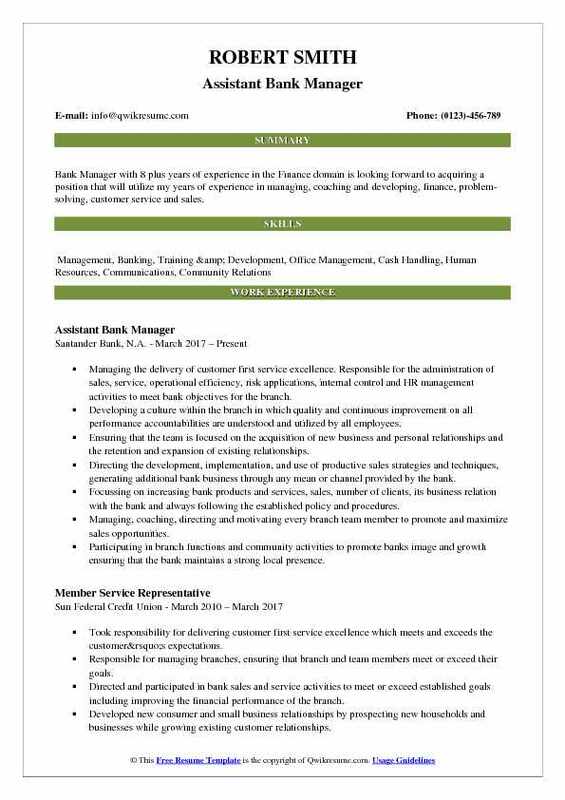 This managerial position requires sufficient knowledge of best practices and modern banking principles, familiarity with banking rules and regulations, human resource management skills, computer competencies and a head for figures and business. While a Degree is commonly seen on the Bank Manager resume, portraying working experience in the banking sector helps to move fast in the hierarchy. 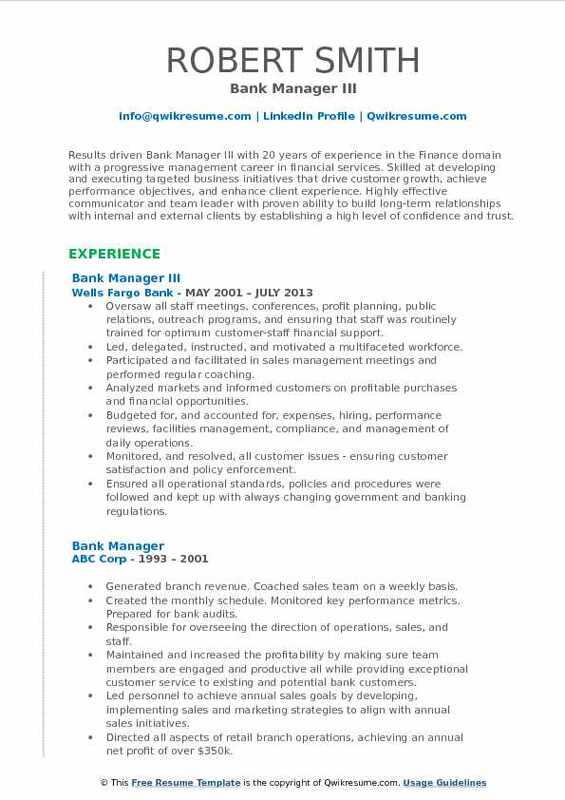 Summary : Results-oriented Bank Manager with over 7 plus years of progressive banking experience. Top performer with a track record of exceeding customers expectations and meeting and exceeding branch and individual sales goals. Finding creative ways to motivate employees to reach and exceed daily, weekly and monthly sales goals, all while providing the highest quality of customer service to all customers. Developing, nurturing and maintaining relationships with referral partners, small business owners, COIs, and realtors. Generating leads for branch through banking lists and creativity that lead to banking opportunities. Performing daily, weekly and monthly bank audits to ensure that the branch is in compliance. Scheduling staff shifts, lunches, breaks and time off. Delegating tasks to employees appropriately while encouraging growth and career development. Introducing all new business and personal banking relationships to celebrate their account opening, ensuring they are receiving a great customer experience and promoting the products that may have been missed. Reviewing all new business accounts and business and personal loan applications before submission. Summary : Bank Manager I with 12 plus years of experience in the Finance domain is seeking to obtain a position which will build and expand on knowledge already established while adding to the profitability of the company. Planning, directing, and controlling the bank sales office operations, ensuring that established policies and procedures are followed and delegating responsibilities to the branch colleagues as needed to meet office objectives. Developing, and designing the different data tracking reports on a branch, district, and regional level which showed sales progress, pipelines, trends, and surplus/deficiencies. Marketing, setting up and conducting the bank at work programs and financial education series seminars for employers in the Waterloo area. Actively calling on businesses in the and holding a cash flow conversation to see if there are opportunities to help with the banks deposit, loan, merchant services, insurance, and other financial service products. Working with customers to fulfill their investment goals by showing them different investment options. Managing, training, and showing coach the bank at work activities not only on a branch level but led it from a district level as well. Working in cooperation with other business lines to develop learning curricula for the company. 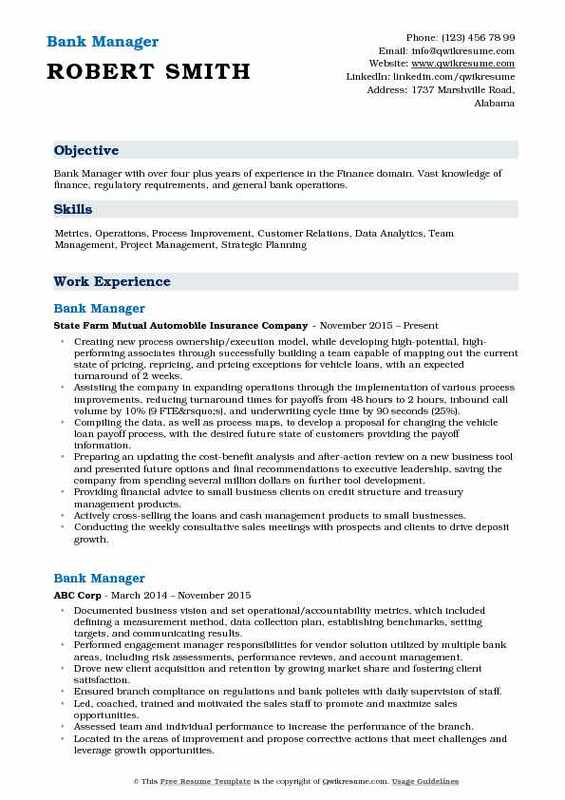 Summary : Bank Manager with 8 plus years of experience in the Finance domain is looking forward to acquiring a position that will utilize my years of experience in managing, coaching and developing, finance, problem-solving, customer service and sales. Managing the delivery of customer first service excellence. Responsible for the administration of sales, service, operational efficiency, risk applications, internal control and HR management activities to meet bank objectives for the branch. Developing a culture within the branch in which quality and continuous improvement on all performance accountabilities are understood and utilized by all employees. Ensuring that the team is focused on the acquisition of new business and personal relationships and the retention and expansion of existing relationships. Directing the development, implementation, and use of productive sales strategies and techniques, generating additional bank business through any mean or channel provided by the bank. Focussing on increasing bank products and services, sales, number of clients, its business relation with the bank and always following the established policy and procedures. Managing, coaching, directing and motivating every branch team member to promote and maximize sales opportunities. Participating in branch functions and community activities to promote banks image and growth ensuring that the bank maintains a strong local presence. Summary : Results driven Bank Manager III with 20 years of experience in the Finance domain with a progressive management career in financial services. Skilled at developing and executing targeted business initiatives that drive customer growth, achieve performance objectives, and enhance client experience. Highly effective communicator and team leader with proven ability to build long-term relationships with internal and external clients by establishing a high level of confidence and trust. 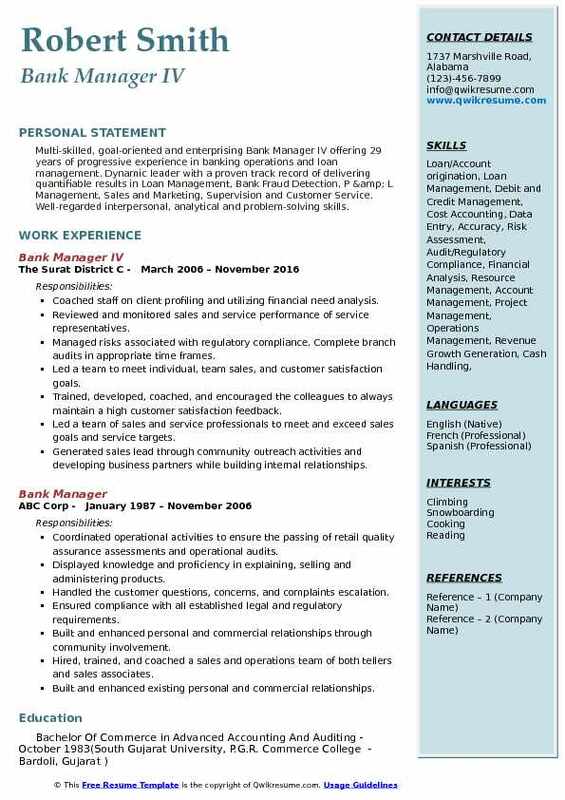 Skills : Complex Problem Solver, Compiling, Searching And Researching Information For Client Resolution, Communication, Team Building Advising, Coaching, Counseling, Mentoring And Empowering, Critical/Analytical Thinker, Computing, Working With Numbers, Basic Accounting, Detailed Oriented, Planning, Laying Out Detailed Process For Achieving Goal. Oversaw all staff meetings, conferences, profit planning, public relations, outreach programs, and ensuring that staff was routinely trained for optimum customer-staff financial support. Led, delegated, instructed, and motivated a multifaceted workforce. Participated and facilitated in sales management meetings and performed regular coaching. Analyzed markets and informed customers on profitable purchases and financial opportunities. Budgeted for, and accounted for, expenses, hiring, performance reviews, facilities management, compliance, and management of daily operations. Monitored, and resolved, all customer issues - ensuring customer satisfaction and policy enforcement. Ensured all operational standards, policies and procedures were followed and kept up with always changing government and banking regulations. Hire new employees. Managed four direct reports. Assured branch balanced on a daily basis as well as complying with standard procedures. Summary : Multi-skilled, goal-oriented and enterprising Bank Manager IV offering 29 years of progressive experience in banking operations and loan management. Dynamic leader with a proven track record of delivering quantifiable results in Loan Management, Bank Fraud Detection, P & L Management, Sales and Marketing, Supervision and Customer Service. Well-regarded interpersonal, analytical and problem-solving skills. Coached staff on client profiling and utilizing financial need analysis. Reviewed and monitored sales and service performance of service representatives. Managed risks associated with regulatory compliance. Complete branch audits in appropriate time frames. Led a team to meet individual, team sales, and customer satisfaction goals. Trained, developed, coached, and encouraged the colleagues to always maintain a high customer satisfaction feedback. Led a team of sales and service professionals to meet and exceed sales goals and service targets. Generated sales lead through community outreach activities and developing business partners while building internal relationships. Supervised branch staff of 10 personnel. Directed responsibility for interviewing, selecting, training, setting and adjusting pay rates and work hours. Directed daily work, monitoring or implementing compliance measures, administering discipline, evaluating performance and recommending hiring and termination decisions. 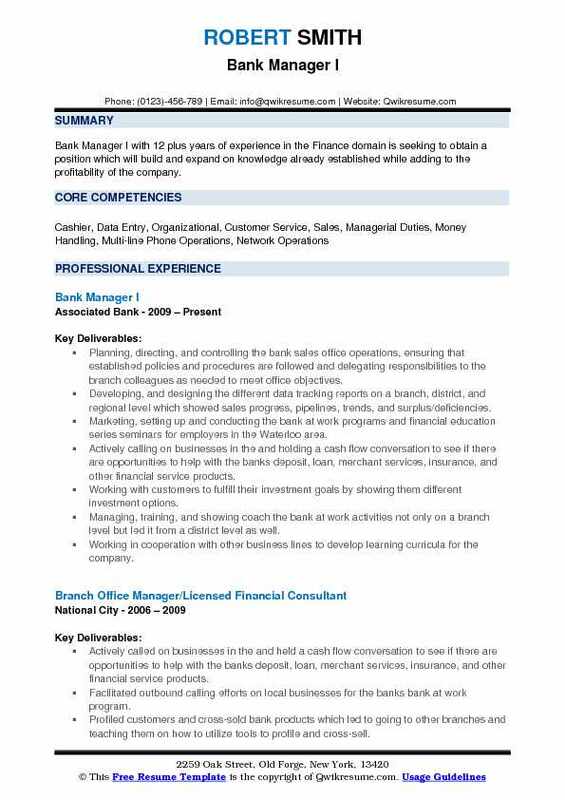 Objective : Bank Manager with over four plus years of experience in the Finance domain. Vast knowledge of finance, regulatory requirements, and general bank operations. Creating new process ownership/execution model, while developing high-potential, high-performing associates through successfully building a team capable of mapping out the current state of pricing, repricing, and pricing exceptions for vehicle loans, with an expected turnaround of 2 weeks. Assisting the company in expanding operations through the implementation of various process improvements, reducing turnaround times for payoffs from 48 hours to 2 hours, inbound call volume by 10% (9 FTE’s), and underwriting cycle time by 90 seconds (25%). Compiling the data, as well as process maps, to develop a proposal for changing the vehicle loan payoff process, with the desired future state of customers providing the payoff information. Preparing an updating the cost-benefit analysis and after-action review on a new business tool and presented future options and final recommendations to executive leadership, saving the company from spending several million dollars on further tool development. Providing financial advice to small business clients on credit structure and treasury management products. Actively cross-selling the loans and cash management products to small businesses. Conducting the weekly consultative sales meetings with prospects and clients to drive deposit growth. Summary : Effective banking manager with extensive experience in the Banking Industry, Marketing and Sales that utilize project management and P&L approach to improve productivity and profitability. Excel at managing Marketing and Sales projects from conception to successful implementation. 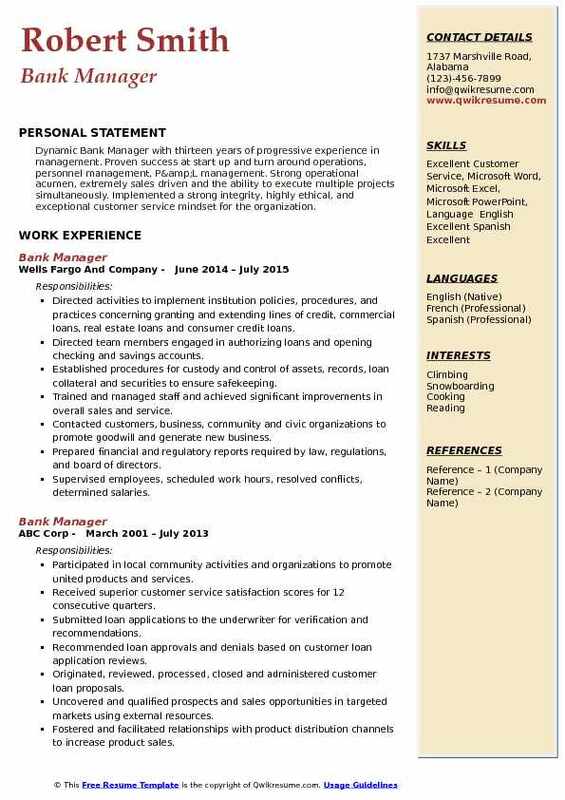 Skills : Customer Service Relations, Marketing, Financial Staff Training & Development, Banking Products & Services, New Business Development, Sales Management, Loan/Account Origination, Regulatory Compliance, Relationship Building, Revenue Growth, Branch Management, Account Management, Teller Operations Communications Detail / Results Oriented. Earned multiple sales awards for being a top performing branch manager. Consistently increased year over year production and revenue in checking accounts and balances, savings accounts and balances, loan, investments and convenience products. Grew deposits balances from 65 million to 98 million within three years period through networking and innovative clients incentives. Training and developing new hires and played a key role during several banking conversations and operational help. Establishing production goals and motivate staff to reach and exceed goals for our branch. 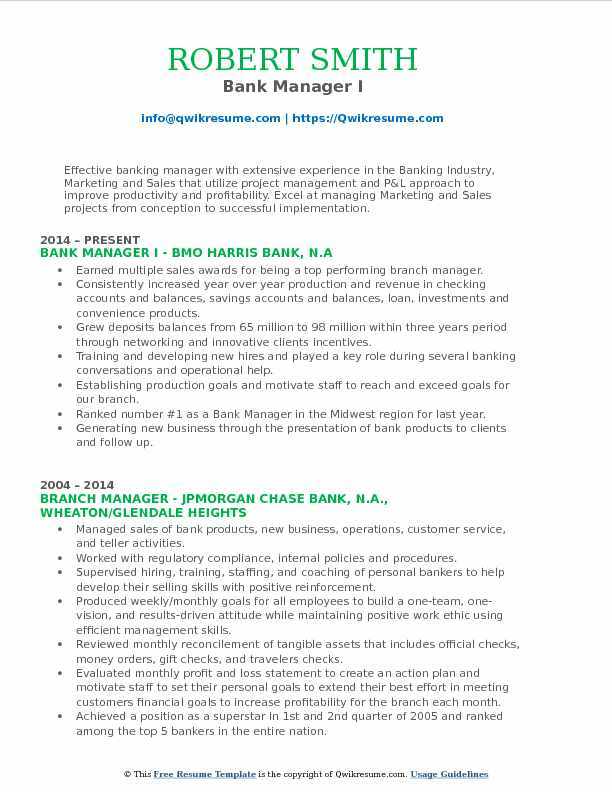 Ranked number #1 as a Bank Manager in the Midwest region for last year. Generating new business through the presentation of bank products to clients and follow up. Provided client support as needed and worked to resolve client matters. Building relationships with internal and external partners to increase sales. Summary : Bank Manager with 12 years of experience in the Finance domain is seeking to expand my career into a new market area, using my extensive experience for further growth and success. Created business plan for the market and surrounding communities within a 5-mile radius. Managed bank sales activities by establishing sales goals and activities to attain new customer relationships and retain existing relationships. Called on small businesses to develop new relationships with prospective clients and retain existing business- over 400 calls. Developed a solid business portfolio through sales, service, and teamwork- added 30 new customers. Recruited by the regional Retail Director, as 1 of 18, selected company-wide to develop a business checking account selector to assist retail associates in the sales of business checking products. Identified and referred customers to commercial banking, investment services, mortgage, trust, private banking, and cash management - over $3 million referred. Developed staff through ongoing coaching sessions and exceed the bank's service quality standards. Planned, directed and controlled the bank sales office operations, and delegated responsibilities to staff as needed to meet office objectives. 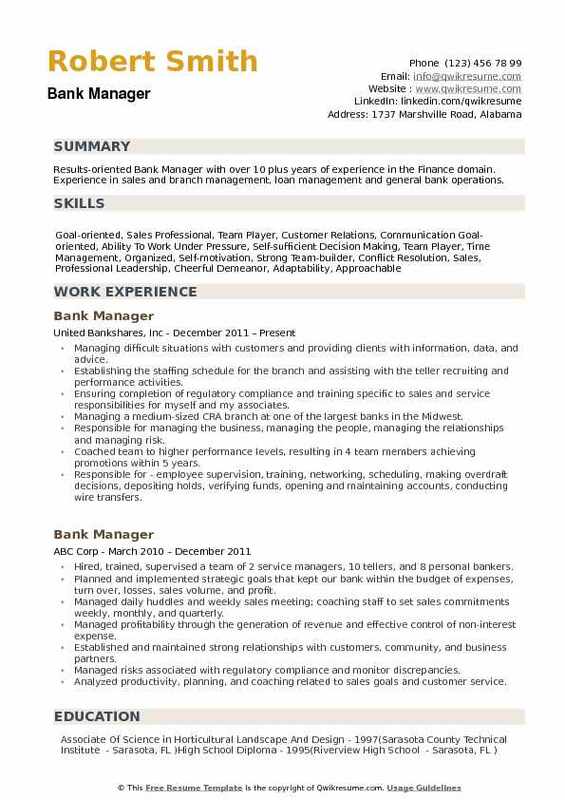 Summary : Dynamic Bank Manager with thirteen years of progressive experience in management. Proven success at start up and turn around operations, personnel management, P&L management. Strong operational acumen, extremely sales driven and the ability to execute multiple projects simultaneously. Implemented a strong integrity, highly ethical, and exceptional customer service mindset for the organization. Directed activities to implement institution policies, procedures, and practices concerning granting and extending lines of credit, commercial loans, real estate loans and consumer credit loans. Directed team members engaged in authorizing loans and opening checking and savings accounts. Trained and managed staff and achieved significant improvements in overall sales and service. Contacted customers, business, community and civic organizations to promote goodwill and generate new business. Prepared financial and regulatory reports required by law, regulations, and board of directors. Supervised employees, scheduled work hours, resolved conflicts, determined salaries. Planned and developed methods and procedures for carrying out activities of establishment. Provided a full range of business banking services to clients with an emphasis on loan and deposit business products. 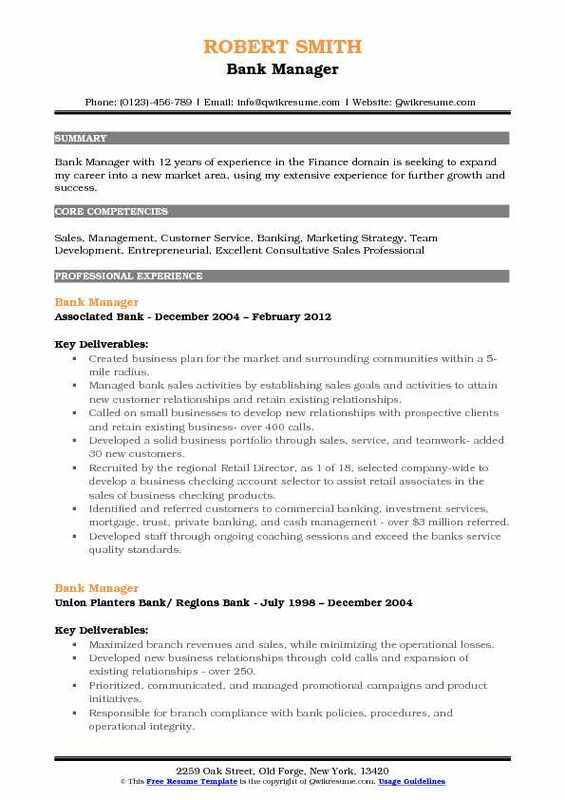 Summary : Results-oriented Bank Manager with over 10 plus years of experience in the Finance domain. Experience in sales and branch management, loan management and general bank operations. Managing difficult situations with customers and providing clients with information, data, and advice. Establishing the staffing schedule for the branch and assisting with the teller recruiting and performance activities. Ensuring completion of regulatory compliance and training specific to sales and service responsibilities for myself and my associates. 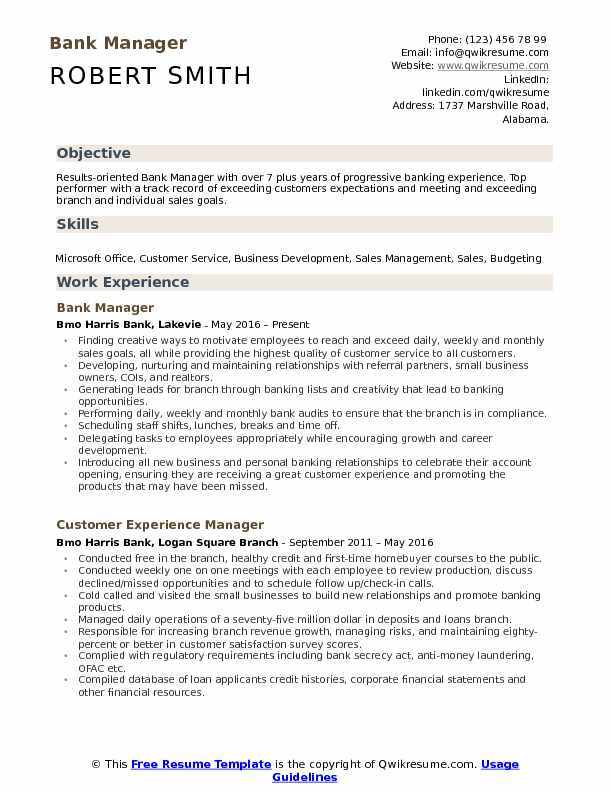 Managing a medium-sized CRA branch at one of the largest banks in the Midwest. Responsible for managing the business, managing the people, managing the relationships and managing risk. Coached team to higher performance levels, resulting in 4 team members achieving promotions within 5 years. Responsible for - employee supervision, training, networking, scheduling, making overdraft decisions, depositing holds, verifying funds, opening and maintaining accounts, conducting wire transfers. Strategizing with the sales team to prospect and qualify potential customers within assigned geographic territories. Managing a wide variety of customer service and administrative tasks to resolve customer issues quickly and efficiently.